Looks absolutely delicious! 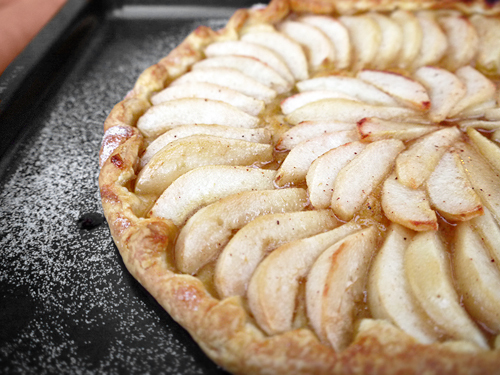 Pear tart and vanilla ice cream -real comfort food and only 15 minutes to make – bonus! Do you have any problems with the pear segments discolouring or is the glaze put on in sufficient time that this just does not happen? Thanks – that’s one good question! When I made it, I don’t think there was enough time for the pears to discolour. I thin it also depends on the type of pear. However, they are discolouring, just have a large bowl of water to hand, and add a good squeeze of lemon juice. 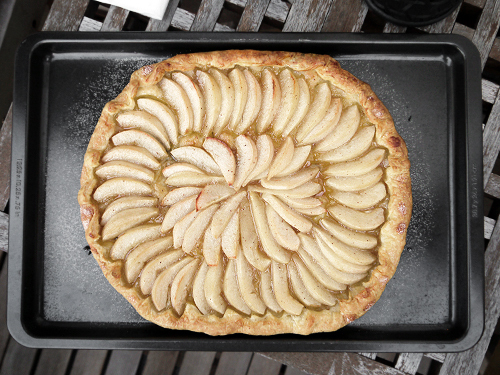 Put the pear slices in there to stop the discolouration as you chop, and just be sure to drain them well before you put the pieces on the tart. This looks delicious. I’ll have to make it this autumn!